In addition, there are two types of sprinkler heads: standard response and quick response. These are what we’re going to focus on in this blog. Standard response sprinkler heads are designed to pre-wet nearby materials before the fire reaches them while simultaneously cooling adjacent areas to prevent the spread of fire. Once the fire consumes all of the fuel around it, it goes out. 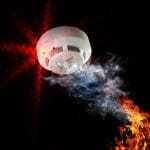 SR fire sprinklers are individually activated, meaning only sprinkler heads directly above the fire will activate. Primarily used for light hazard applications, quick response fire sprinkler heads discharge water higher up on the ceiling. 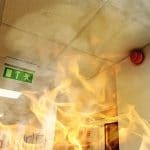 This cools the ceiling, preventing flash-over and increasing people’s chance of survival as they attempt to evacuate. QR fire sprinkler heads are standard for highly populated buildings such as health care facilities, assisted living facilities, and residential occupancies. The biggest difference between quick response and standard response sprinkler heads is their activation temperatures. As the names suggest, quick response sprinkler heads activate at slightly lower temperatures than standard response heads, suppressing the spread of fire more quickly. Physically, the only difference between a standard response and a quick response fire sprinkler is the size of the bulb – standard response sprinklers have a 5 mm glass bulb, while quick response fire sprinklers have a 3 mm glass bulb. All of which will determine whether it’s more effective to install standard response or quick response sprinkler heads. Call Fire Control Systems to help you determine which is best for your needs.